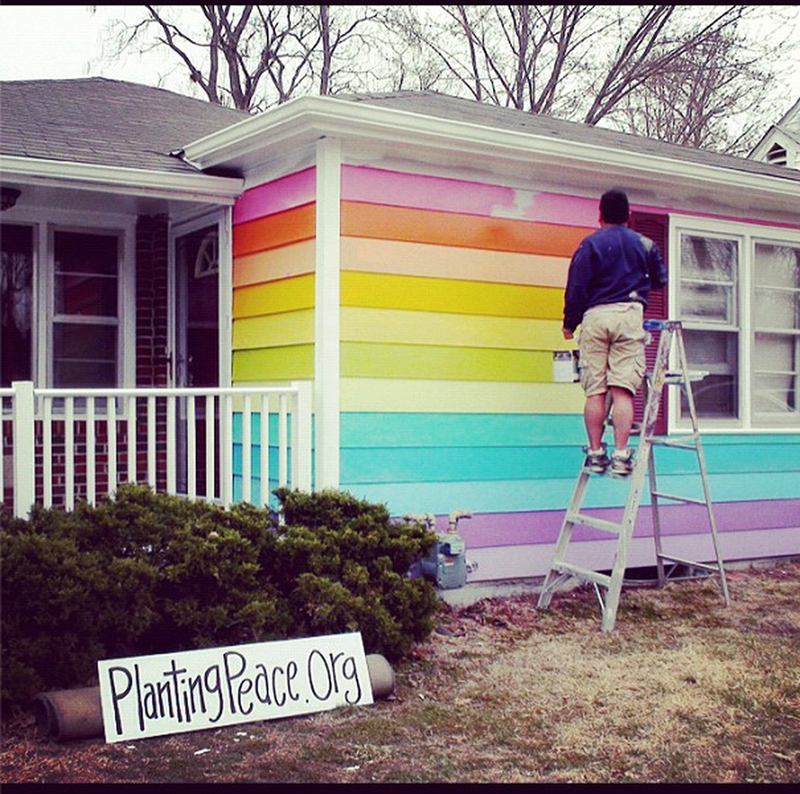 Planting Peace is painting their house across the Westboro Baptist Church in Topeka with the colors of the gay pride rainbow. Amazing how those at Westboro try to twist & use the Bible & God for hate. Sadly their not the only ones. When people start recognizing the charade, they'll stop getting attention. These people don't actually believe what they say, they're just a bunch of lawyers trying to incite a violent response. And frankly, anyone who responds to them in a manner that would involve a lawsuit deserves what they get. I agree, however, I do like the good old fashioned non violent protest. That's a myth. They are definitely trying to incite a violent response, but they believe every word they say. Of course they believe what they say. Just read what one of their estranged children have said about them. I'd love to see sources that prove that they exist to try and entice people to attack them so that they can sue. But this is the same made up claim that is made for every whack job that proselytizes unpopular religious opinions (see Preacher Bob). Where are all of the court cases that fund the $200,000 they spend annually on protesting? I've been able to find that they've won ~$143,000 in the 90s and seeking another ~$100,000 in lawyer fees now after defending themselves in a lawsuit brought upon them by a marine's father and that father lost the case. But those barely make a dent in the cost of doing business. They're funded by their 70 or so member congregation and refuse outside donations. You don't abuse your kids for decades and disown them for "show." You don't continue something for 20 years as a "business model to make money" when the money being made is miniscule compared to the cost of doing "business." They're nut jobs and all proof points to it. 10 of the 13 children are lawyers. I'm willing to believe that Fred Phelps is completely insane. But not his children. The things they say are not even coherent, much less logical. So they're either deranged or they're acting. How can they be money-making law professionals and at the same believe the illogical and irrational things they say? Either it's acting, or it's a strong case of cognitive dissonance. I dont really think they were aiming to please. I think it was much more important to have the annoyance factor. What does being professionals in a field have to do with it? The majority of Americans believe millions of different species fit onto a 440' x 73' x 43' Ark and all of them coexisted without killing one another or eating for a year. Explain the logic behind that. Being a professional in a field means someone must have rational thought? Make fun all you want, you're in the minority here kaje. The Phelps have been protesting for probably at least 20 years. I guess people never get tired of their outrageously poor taste in protesting.